The Cannae book arrived today. When I went to give feedback on Alibris, apparently I'd already done so. Probably I confused the Fall of Carthage book, which I bought from the Hive, with this book by the same author. Eh. Dozy. At some point I need to reorganise my books yet again, in order to bring the Roman ones together. Or more together. More shelf space is needed! This little book came in the mail last week. I expected a large, thin paperback but it's a small hardback, and rather nice. Also very readable. The original book was published in 1876 and it's been reprinted by the British Library. 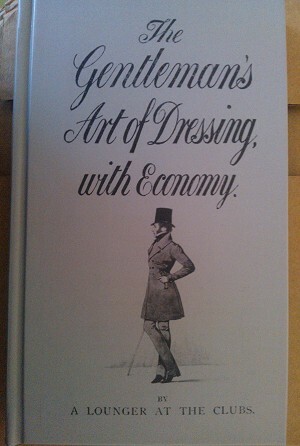 Victorian male fashions I know little about, so it seemed worth picking up a copy. The first few chapter address the overall theme of the title: buy good quality clothes at a fair price, and then take proper care of them. The next chapters deal with individual items of clothing. It's looking to be a useful little book. There hasn't been a lack of acquisitions so much as a lack of posting. Bad dog! Also, Monissaw hasn't been reading (*glares at monissaw*). Eh. An Illustrated History of the Royal Navy by John Winton. I was in the Co-op buying freezer bags when I happened to browse their charity book table, and found A History of Polar Exploration by David Mountfield. Pictures! After reading this BBC News article about Benjamin Leigh Smith, I was curious to see if he were in it, and indeed he does get a brief mention on page 117. Soon as I organise where to post a wishlist, Peter Capelotti's book about Leigh Smith will be on it. Not cheap, though--maybe a Christmas or birthday present if I'm good. Husband also raided Waterstones on a mission for sticky labels* later in the week and brought home David Mitchell's Cloud Atlas. Since which acquisition he's been asking me every five minutes how I'm getting along with it. Umm, gimme a chance! Then yesterday I went to the market, the charity shops, and the local independent bookshop, and came home with three books for my father and four for me. I bought him a book about experiences of National Service, and in the car I almost joked to my husband that the first thing Dad would say would be, "They didn't ask me!". Guess what was the first thing he said? Oh dear, never mind, lol. Torture Team: Decpetion, Cruelty and the Compromise of Law by Philippe Sands. Heavy stuff. I'd looked at it a few times in the bookshop and wondered if I should get it, as torture is something I argue with people about a lot. I was pretty disgusted by the US government claiming they don't torture people on the basis that they had redefined waterboarding as not being torture. Yeah, and I'm a duck. Collateral damage. Involuntary conversion. Etc. The hefty Faber Book of Exploration, edited by Benedict Allen, for a mere 75 pence. The spine has been cracked at or about the Franklin Expedition but other than that it looks unread. Not so much the £1 Signature Killers by Robert D. Keppel, which has been read, dragged through a hedge backwards, introduced to mould and used as a coaster. Still, it has been kicking around the world since 1998. The final book acquired was Georgette Heyer's Frederica. Because I'm not above a little light reading when the brain wants it. Not a bad haul. But not a single SFF book to be had. *I suggested to the family that putting seeds from the garden into old herb or spice bottles was likely to lead to some undesirable poisonings, so it was posited that sticky labels could reduce the risk. As apparently the original labels really don't like to come off. So it seems I'm not reading Despatches, as I haven't picked it up in other a week. At least opened it, it's in my bag so it get picked up a lot. Currently I'm reading a chapter from the Mounted Police of Victoria & Tasmania. Although it's mostly names, and what they did. I should look for a NSW one.